Can non-hydrostatic compression be used as a tool to get metastable phases of materials? In a recent Journal of Physics: Condensed Matter paper, Dr Alka Garg et al. investigate scandium orthovanadate to find out. Read on to find out more from the authors themselves. Pressure, an important thermodynamic variable, can change inter-atomic distances in solids by an order of magnitude, dramatically altering the electronic properties. This occurs by breaking the existing bonds, or forming new chemical bonds which in turn leads to variety of fascinating phenomena. These include metallization, amorphization, superconductivity and polymerization. Hence, compression provides a unique possibility to control the structure and properties of materials without altering their chemical composition. In fact, pressure induced irreversible phase transitions can lead to the discovery of new materials with novel properties. Modern high pressure researchers use a palm-sized device known as Diamond Anvil Cell (DAC), where a small amount of materials is squeezed between two diamonds to apply pressures in the giga-Pascal range in a controlled fashion. To make sure that the material is pressurised hydrostatically, it is immersed in liquid/gas which transmits the applied load equally in all the directions. In our recent paper, we investigate the behavior of rare earth orthovanadates under hydrostatic /quasi-hydrostatic compression using various experimental techniques such as x-ray diffraction, Raman spectroscopy, and optical absorption, along with first principles calculations. Most of these materials show a structural phase transition from ambient zircon structure to scheelite structure, and on further compression the scheelite phase is transformed to fergusonite phase. On decompression, the fergusonite phase returns to the scheelite phase – which is metastable. We found that quasi-hydrostatic compression can trigger the scheelite to fergusonite phase transition at much lower pressure, which led us to think that non-hydrostatic compression may lead to the direct transition from zircon to fergusonite phase which may be irreversible. Indeed, when we compressed scandium vanadate non-hydrostatically, material transformed from zircon to the fergusonite phase. This fergusonite phase could be retained at ambient pressure which has a smaller band gap than the zircon structured scandium vanadate thus finding its potential applications in green energy technology as photocatalyst (see figure). 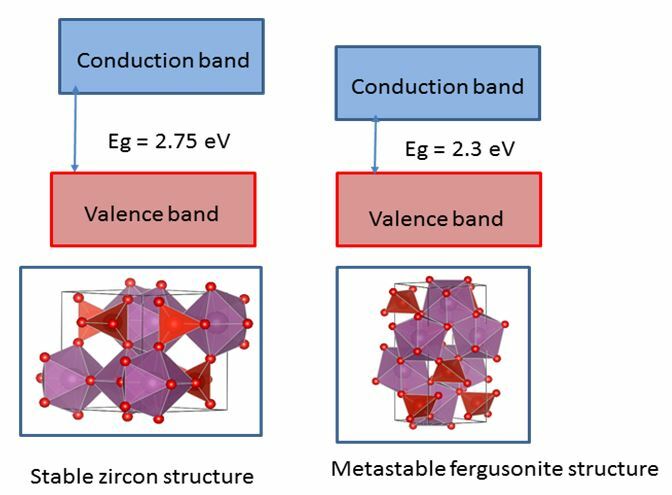 Band gaps for the zircon to fergusonite transition © Alka Garg 2016. We hope this piece of research will provoke numerous scientists working in the field of high pressure research to search for new materials with novel properties. Scientists can reinvestigate materials which have shown pressure induced reversible phase transitions when compressed hydrostatically, under non-hydrostatic compression. Furthermore, the observation of phase transition accompanied by a change in band gap at moderate pressures will have merit for applications like touch panel and sensors. ‹ Which chemicals are best degraded by electrical plasmas?